An educational chemistry set that teaches youngsters that learning is creative and fun. Albert Einstein said true intelligence came from the imagination. In that spirit, this edible chemistry set combines creativity and fun for youngsters on their way to becoming the great minds of tomorrow. 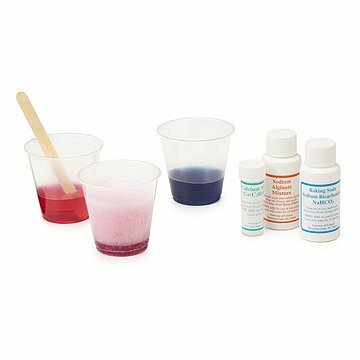 Through experimenting with the kit's contents kids will learn about acids, bases, solutions, formulas, reactions, carbonation, indicators, pigments, gels, polymers, and more with their hands and their tastebuds! The possibilities are as endless as their imaginations; some will create fizzy carbonated concoctions, others might prefer making green jelly blue, but all will learn the basics of chemistry while having a blast. All ingredients are 100% safe to eat and/or drink. Made in Virginia. My nephews had fun "experimenting" however, do not expect this to taste good just bc it says "edible". My two nephews did not enjoy the favors at all. My brilliant 4-year-old nephew LOVED this gift and immediately made a "gelatinous blob" (his name) of which he was immensely proud. The niece who likes to 'experiment' finally has a fun, safe way to do her own experiments. Yay! Great product to get children interested in both science and food.